In case of above installations, the Install setup automatically deploys web applications first during the BI platform installation and then undeploys them during the first add-on installation preparation. The setup during the add-on installation process re-deploys the web applications. This automatic process of undeploy and redeploy web applications continues for each of the add-ons thereafter. This leads to additional install time during multi-package installations and a less efficient installation process. 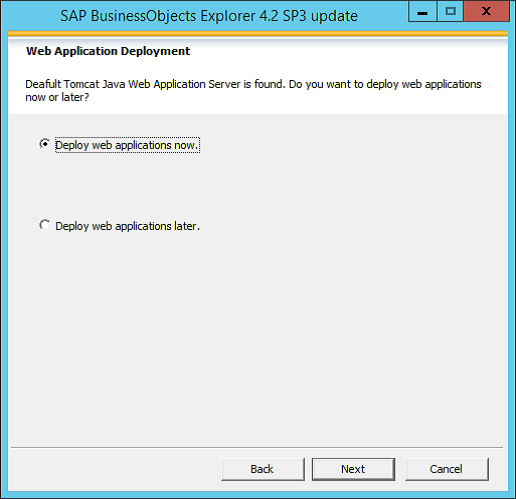 With SAP BusinessObjects BI 4.2 SP03 and later, there is a means to suppress automatic deployment of web applications during the installation in case of multi-package BI landscape update. 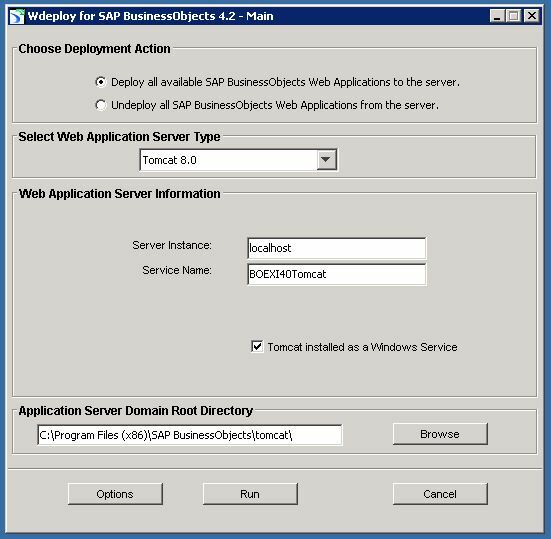 As an administrator updating your BI landscape, you can choose to “Deploy Web applications Now” or “Deploy Web applications Later”. 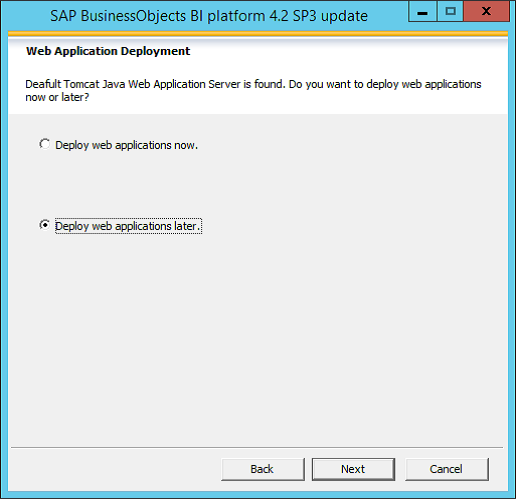 Suppose you are trying to update to 4.2 SP03 versions of BI Platform and Explorer in series and have the default Tomcat web application server in your system. 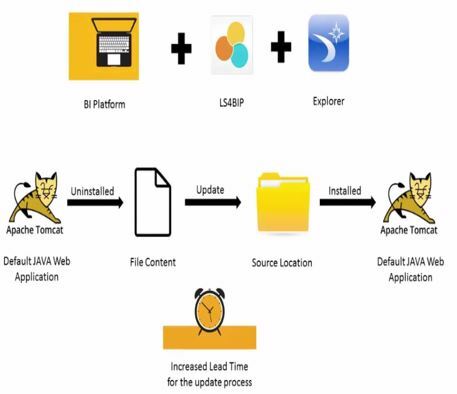 When you run the BI Platform installer, it automatically detects the default Tomcat application server and provides a User Interface screen to choose to “Deploy Web applications Now” or “Deploy Web applications Later”? Choosing the option to “Deploy Web applications Later” will suppress the automatic deployment of web applications during BI Platform installation. The setup undeploys the web applications and updates the Web Application content in the source location during installation of new binaries. BI Platform installation completes and you can check that you are not able to access the Central Management Console web link. Now when you run the Explorer installer, the User Interface screen with Web Apps Deploy options show up again. Since Explorer is the last add-on in this scenario, you can choose to “Deploy Web Apps Now”. The setup runs and during this case, the web applications will be deployed with the updated content from all the packages updated until now. Note: If you choose, “Deploy Web applications Later” during the setup of the last add-on, then there is no need to worry. You can always choose to use “wdeploy” tool to manually deploy the web apps to the Tomcat server. Since the content gets updated during setup of the last add-on, there will not be any deployment content loss. 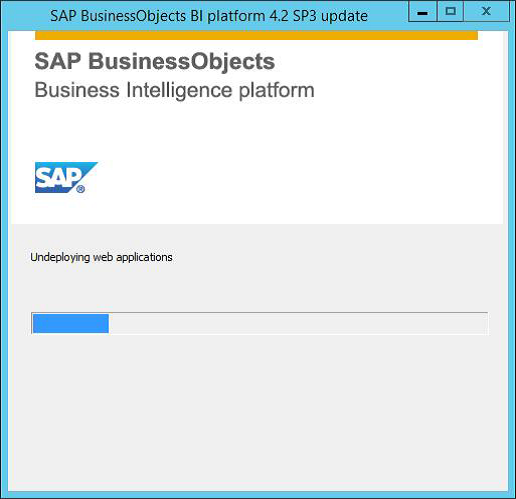 Update of SAP BusinessObjects BI Platform + SAP BusinessObjects Explorer in series. This option is available for both Patch and Service Pack updates. This feature would be applicable to other BI Platform Add-ons in the future releases. Start the update always with the BI Platform Server setup. If you have chosen Phase-wise Install and performed caching earlier, the setup will automatically check for the caching completeness and perform re-caching if it is not complete. Restart the machine after the installation of each component – server and add-on. Choose “Deploy Web applications Now” when you are installing the last add-on. If you choose, “Deploy Web applications Later” during the setup of the last add-on, then there is no need to worry. You can always choose to use “wdeploy” tool to manually deploy the web applications to the Tomcat server. Since the content gets updated during setup of the last add-on, there will not be any deployment content loss. Thanks Swapnil. Looking to write more on the upcoming enhancements. Stay logged. I used this setting on the upgrade for BO 4.2 SP3 earlier this year. Now I’m facing the problem that when I install an addon (SAP Lumira) after the installation the war files are not deployed. Do you know where to find this setting, it looks like its stored somewhere and used for every installation that is done afterwards.